Wow, what a week for Mitt Romney. And what a week for Newt Gingrich. Romney wins the Nevada caucuses but picks up an endorsement he might not want. Okay, first for the wee little poor choice of words by Romney this week. And we of course mean the “poor” choice of words about not worrying about the poor. Okay fine, the words were taken out of context and he didn’t really mean it the way it was portrayed by some. But that doesn’t let Romney off the hook. Not surprisingly, Romney’s intent had little to do with whom he is “concerned” about and a great deal to do with trying to convince middle class voters that he doesn’t represent exactly the kind of person/economic policy that benefits the very rich at the expense of the middle class. In short, he was trying to create a new reality to replace the one that isn’t so good for the middle class, i.e., the one that he supports. Good one, Mitt. Embrace the buffoonish bigot tea party vote. That ought to help you with independents. Especially now that the stock market is at highs not seen since before the Bush depression and the unemployment has been dropping as hundreds of thousands of jobs are being created per month. Meanwhile, Gingrich is asking for prayers. And he’ll need them since he is looking forward to Super Tuesday. Yep, he’ll just skip Nevada, Maine, Colorado, Minnesota, Missouri, Arizona, Michigan, and Washington since they don’t matter (and he can’t win) and focus on the Super Tuesday states (even though he didn’t even make the ballot in at least one of them – Virginia). Well, that certainly is a plan. Sort of like Rudy Giuliani waiting for Florida in 2008. That worked out well. Oh, wait. Never mind. 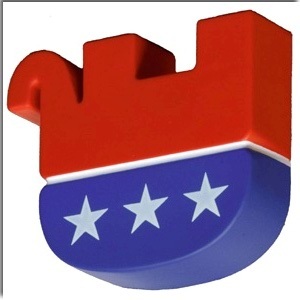 In the never ending sideshow called the Republican nomination process, the tea party was all abuzz that famed hair piece holder Donald Trump would today announce his endorsement of Newt Gingrich for President of these here United States of America. Now why anyone would think that a Donald Trump endorsement is something to, well, trumpet, is beyond comprehension. But hey, the tea party reveled in the news. It turns out that the news – like virtually everything the tea party believes – was false. Trump is endorsing Mitt Romney. Yes, Donald Trump, the man who faked a run for the Presidency (again) and suckered the tea party into anointing him “savior of the week” immediately after making racist comments, has decided that someone must actually care that he is endorsing a candidate for the Republican nomination. And to make sure that he got credit for picking the right horse he conveniently waited until the horse was touching his hoof on the finish line while the other horses were still being dragged by their riders around the fourth turn. Yep, Trump’s endorsement will sure give Romney a boost. 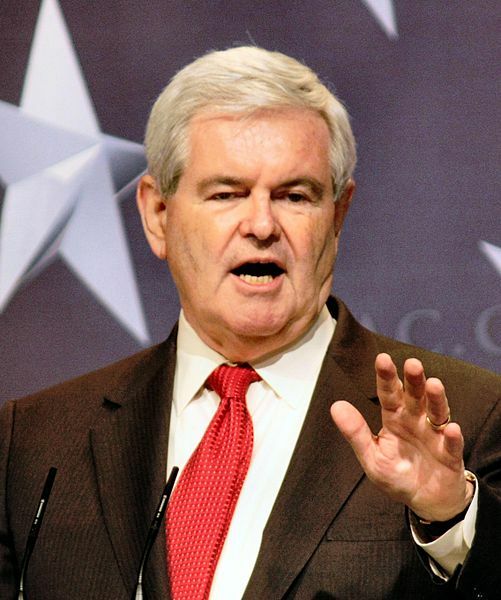 Cain Endorses Gingrich – Romney Rejoices! In breaking news Herman Cain is endorsing Newt Gingrich in the Republican race for the nomination. Mitt Romney breathes a sigh of relief. Begins preparing for the general election. Think about it. Herman Cain. The man who dropped out of the race after a “lady friend” of his went public with what she claims was a 13-year affair. The man who had several women file sexual harassment charges against him 20 years ago. The man whose 9-9-9 plan would have raised taxes on the middle class and poor but lowered taxes on the super-rich, all while dramatically increasing the debt. That Herman Cain has officially endorsed Newt Gingrich for the nomination. The Newt Gingrich whose 2nd ex-wife recently accused him of asking for an “open marriage” so he could dawdle with the woman with whom he had been having an affair. Gingrich’s first wife was his former high school teacher. He married her when he was 19 years old and she was 26. One wonders when they started their relationship given Gingrich’s age. Apparently bored with the older wife, Gingrich left her after beginning an affair with the woman who would become his 2nd wife, a woman who was 9 years younger than he. Then, not long after she was diagnosed with multiple sclerosis, Gingrich divorced her to married his 3rd (and current) wife, with whom he had been carrying on an affair for some time. This wife was 23 years younger than him and was a staffer in the House of Representatives. So yes, Gingrich was impeaching President Clinton for having his intern escapades while Gingrich himself was actively engaging in his latest affair with a young Congressional staffer. One has to marvel at Gingrich’s ability to compartmentalize in order to avoid impeaching himself for such blatant hypocrisy. In any case, it does seem that Cain and Gingrich have some things in common, though it’s uncertain whether this is the reason behind Cain’s endorsement. The net effect, of course, is, well, actually, not really that much. After all, this is Herman Cain we’re talking about. It’s not like an endorsement from him carries a whole lot of weight. But it does help Mitt Romney. Romney’s biggest problem is that he has had to cant so far to the right to get the tea party bigot vote that he has been hemorrhaging independent and moderate voters left and right (and middle). With Cain offering to help solidify Gingrich’s extremist right vote, thus eliminating any chance of winning the primary in Florida or the caucuses in Nevada, the contrast allows Romney to start trying to track back towards the middle. Way to go, Herman Cain!